Summary: The book is a story, set in China, at a time when an Emperor still ruled. Everyone in his kingdom loved plants and because there were so many the air smelled like perfume. As the Emperor realized he was aging and needed to find a successor, he decided to have a contest to see who could grow the best plant. The emperor gave every child a special seed to see who could grow the best plant, except the seeds were cooked and could not grow. Only one boy had the courage to bring an empty pot before the Emperor while everyone else brought a beautiful flower. The Emperor recognized the fact that the little boy was the only one who had not cheated so the boy was made the next Emperor. Theology: The image that first came to me was the Garden of Eden and how beautiful it must have been and how the air might have smelled like perfume. The story of the talents as told in Matthew could also be used to illustrate how the Bible might look at doing our best and being rewarded for it. Why do you think the other children selected seeds of their own rather than the seed the Emperor gave them? How did Ping feel as he walked to show his plant to the Emperor? How did the Emperor feel when he saw all the plants the children brought him when he knew they had not used the seeds he gave them? 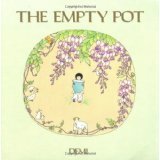 The Empty Pot by Storypath is licensed under a Creative Commons Attribution-NonCommercial 4.0 International License.